ELN’s Level 4 External Quality Assurance courses are approved by NOCN and Pearson Edexcel. We currently offer only the theory unit. The theory unit on its own provides the Level 4 Award in Understanding the Principles and Practices of External Quality Assurance of Assessment. This is an excellent upgrade for anyone already qualified as an internal verifier who would like to learn more about the quality assurance process from an Awarding Body or regulatory point of view. Doing the two unit course qualifies you to work for any UK Awarding Body in a capacity to conduct independent External Quality Assurance or External Verification visits to a range of FE and HE Colleges, Training Providers, Colleges, Schools etc. We will be able to take registrations for the unit 2 in the 2019 academic year intake. We currently only offer the Unit 1 which is a pre-requisite for the practical unit 2. These courses are suitable for people with demonstrable experience in Education & Training and Learning and Development. You should be qualified and an experience practitioner of Internal Quality Assurance before doing this course. 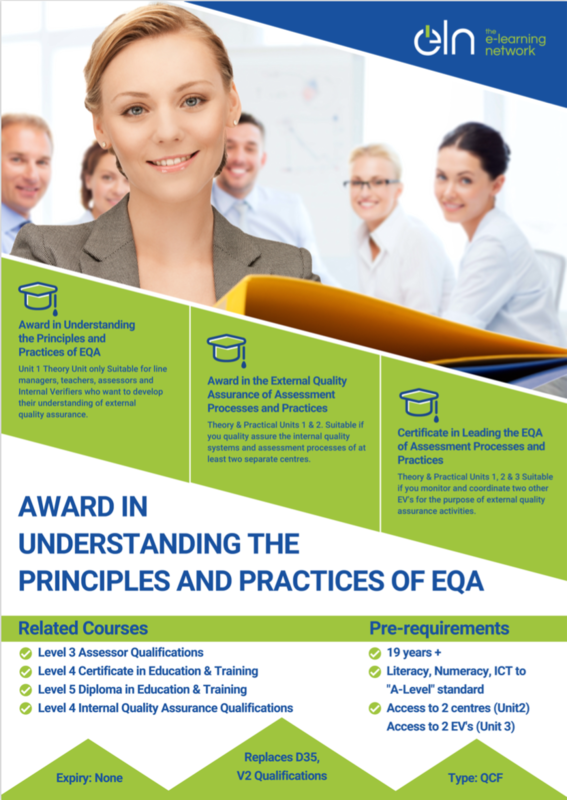 Why should you take up ELN’s Level 4 External Quality Assurance course? Choose Option 1 if you would like to know more about External Verification but do not work as an External Verifier (yet!). Choose Option 2 if you have access to work as an EV or EQA and conduct External Quality Assurance visits. Choose Option 3 if you have access to work as an EV and you also lead a team of a minimum two other External Verifiers. Your tutor will conduct a detailed personalised 1:1 initial interview with you before you begin your Level 4 Qualification in External Quality Assurance. For more details, click to expand the 'Assessment' Tab below. All the External Quality Assurance qualifications are based on the assessment strategy and qualification structures, devised originally by Lifelong Learning UK (LLUK), and are now owned by the Learning and Skills Improvement Service (LSIS). Be qualified and have experience working as IQA for 2-3 years. Access to two centres for the purpose of conducting external quality assurance activities (for Unit 2 only). Access to two other External Verifiers who you help with planning, montioring and coordinating external quality assurance activities (for Unit 3 only). Maintain the currency of own expertise and competence as relevant to external quality assurance. Agree responsibilities and SMART (Specific, Measurable, Achievable, Realistic and Time-bound) objectives with team members. Your tutor will conduct a detailed personalised 1:1 initial interview with you before you begin your Level 4 Qualification in External Quality Assurance. 2 x draft/initial external quality assurance plan, 2 x final EQA plan, quality assurance / verification evidence, EQA feedback and report, management of all the data. Wherever possible we will work with you to fulfill the assessment criteria using your existing work evidence. 1 x brief assignment, 1 x monitoring plans showing monitoring and standardisation of at least two other external verifiers, 1 x Review of the monitoring activities.